Moving files from one platform to another platform is one of the prominent features which makes a file available to n number of platforms. This feature enables users to carry their data files from one system to another using an external drive. Although, this option is not capable for users using Microsoft Outlook. The users cannot carry their individual emails to another system without migrating them to some other data format which is more portable. Usually, MS Outlook uses PST files for storing mailbox data on local machine. It requires MS Outlook to preview the contents within it which means the email application should be installed to view emails of Outlook. To overcome the problem, one needs to convert Outlook emails to PDF with attachments. A PDF is a Portable Document Format which can be migrated from one system to another without any issue. It can be accessed in any OS as long as Adobe Reader is installed in it. This article describes in detail that how to perform conversion using PST to PDF Converter. Read the following section to know what this application is capable of. This software is a top rated solution which can used to save Outlook emails as PDF format along with its attachments. It is a secure and reliable tool which not only helps you to perform migration but can also repair damaged Outlook data file. The software is capable enough to transfer entire mailbox such as emails, calendar, contacts, etc. And the most essential part is that it does not require MS Outlook to be installed on the user system. Outlook Versions – Supports all versions of Windows Outlook but does not support Outlook for MAC. 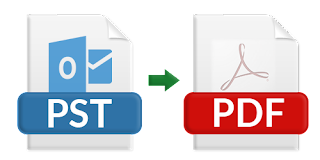 Convert PST File to PDF – The software can easily transfer all the mailbox items of Outlook such as emails, contacts, journals, notes, calendar, etc. It also provides an option to select items from the mailbox and supports both ANSI and UNICODE PST files. Two Modes for Conversion – Using this PST to PDF Converter software, users can upload Outlook data file using two ways. One is by using File option which imports single PST file and other option is opting for Folder mode which allows to upload multiple PST files. Selective Data Migration – Users are allowed to choose single mailbox items for conversion such as emails and can leave the rest of mailbox items such as contacts, notes, journals, etc. The utility allows users to view email attributes such as, Cc, Bcc, Sent date, etc. Apply Date Filters – Another important feature of the tool is that users can filter the mailbox data according to the date. You just have to specify a date range from which you want to save Outlook emails as PDF. This will help you to perform time saving and prevent needless conversion. Offers Date Stamping & Numbering – Users can also use the advance feature of this software which enables them to provide bates numbering and date stamping to the output PDF files. The folder hierarchy will not be altered during the transfer process. There are both positive and negative aspects which are associated with every task and PST file to PDF conversion tool is not an exception. The pros of the software includes batch export of PST file to PDF format. Users can transfer the entire folder containing PST files. It also allows users to apply date filters to migrate limited mailbox items. The software exports both ANSI and UNICODE PST files without any issue. Whereas on the other hand, there is no support for Mac systems. To move mailbox data from one system to another becomes such a tiring task for novice users who are not familiar with the technology. As the manual method involves to print each email separately which is a time consuming task. So, the users who are looking to save time can use PST to PDF Converter which is easy to use and quite relevant when compared to the manual approach.